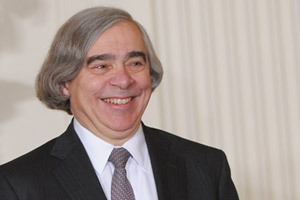 When President Obama nominated  Ernest Moniz to be energy secretary earlier this month, he hailed the nuclear physicist as a “brilliant scientist” who, among his many talents, had effectively brought together “prominent thinkers and energy companies” in the continuing effort to figure out a safe and economically sound energy future for the country. Indeed, Moniz’s collaborative work – best captured in the industry-backed  research program he oversaw at The Massachusetts Institute of Technology – is well known. So, too, is his support for Obama’s “all of the above ” energy strategy – one that embraces, fossil fuels, nuclear, and renewable energy sources. Slocum pointed out that Moniz, if confirmed, will set research and investment priorities, including at the department’s network of national laboratories . Reaction to Moniz’s nomination has been mixed among environmental groups, ranging from support (Natural Resources Defense Council ) to concerned acceptance (Sierra Club ) to outright opposition (Food and Water Watch ). What criticism there has been has focused on his support for nuclear power  and for natural gas extracted through fracking as a “bridge fuel ” to transition away from coal. He was on BP’s Technology Advisory Council between 2005 and 2011, a position for which he received a stipend, according to BP. Spokesman Matt Hartwig said the company does not disclose details of such payments. (A 2012 BP financial report  disclosed that one council member received about $6,200.) The council “provides feedback and advice to BP’s executive management as to the company’s approach to research and technology,” according to the company. BP has also provided  $50 million in funding to Moniz’s MIT Energy Initiative. Moniz talked about that relationship while delivering a warm introduction  before a 2009 speech at MIT by BP’s then-CEO Tony Hayward. From 2002 to 2004, Moniz sat on  the strategic advisory council of USEC , a public company that provides enriched uranium to nuclear power plants. A company spokesman said Moniz was paid for his role on the nine-member council, but declined to say how much. USEC, which has been seeking  a $2 billion loan guarantee from the Energy Department for a centrifuge plant in Ohio, has applauded  Moniz’s nomination. He’s on the board of ICF International , a Fairfax, Virginia-based company which does energy and environmental consulting. It has received Energy Department contracts  as part of what one executive called  a “longstanding relationship with the Department of Energy.” As a board member, Moniz got $158,000 in cash and stock in 2011, according to the company’s most recent annual report . He is on the strategic advisory council of NGP Energy Technology Partners , a private equity firm that invests  in both alternative energy and fossil fuel companies. The Washington, D.C.-based firm declined to comment. He is on the board of advisers of another private equity firm, the Angeleno Group ,which says it provides “growth capital for next generation clean energy and natural resources companies.” The Los Angeles-based firm didn’t respond to requests for comment. He is a trustee of the King Abdullah Petroleum Studies and Research Center (KAPSARC ), a Saudi Aramco-backed nonprofit organization. The organization did not respond to requests for comment. He was on the board of directors of the Electric Power Research Institute  from 2007 to 2011, following a stint on the group’s advisory council that began in 2002. A nonprofit utility consortium, the organization does research for the industry with an annual budget of over $300 million. The group paid Moniz $8,000 between 2009 and 2011, according to its most recent tax returns . Since 2006, Moniz has been on the board of General Electric’s “ecomagination ” advisory board which advises the company on “critical environmental and business issues.” The company did not respond to inquiries about compensation. Moniz’s nomination has not encountered  resistance from the Senate, where the Energy and Natural Resources Committee is scheduled to hold a hearing on Moniz April 9. Steven Chu, the outgoing energy secretary, received scrutiny over his ties to BP. The company had chosen  the lab Chu headed at the University of California, Berkeley, to lead a $500 million energy research project. BP’s chief scientist at the time of the grant, Steven Koonin , became Chu’s undersecretary for science. When the Energy Department became involved in the government’s response to the 2010 Gulf oil spill, Koonin recused himself. Critics who thought the administration was too soft on the company pointed to Chu’s ties  to BP. But no evidence emerged that Chu had played any role going to bat for BP within the administration.